A coalition of community and religious leaders from multiple faiths and backgrounds is utilizing the common-sense booklet The Way to Happiness as one of its key tools in bringing peace to neighborhoods of Los Angeles that have been affected by gang violence, with measurable results! Above photo: Thousands of people from communities all over Los Angeles converge at the United in Peace Foundation's Peace Ride rallies, to promote peace and unity. Since October 2012, the United in Peace Foundation has organized monthly Peace Rides, with over 50 biker clubs and more joining each month. Hundreds of motorcycles take to the streets and go directly into those neighborhoods which have been most affected by gun violence. At each stop, the bikers engage and embrace the people of these communities, promoting unity and peace through the distribution of a reprint of the historic Million Man March Pledge of 1995, and The Way to Happiness. 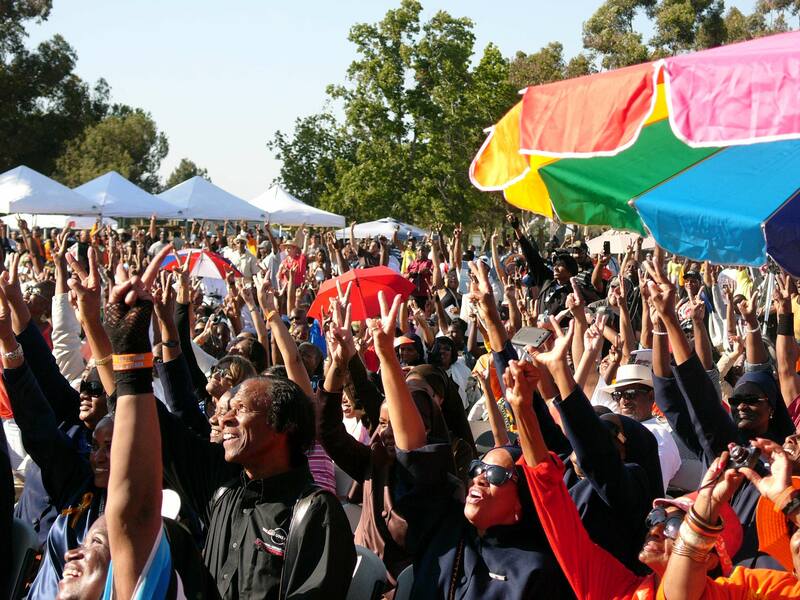 Thousands of people from communities all over South Los Angeles converge at the United in Peace Foundation’s Peace Ride rallies, to promote peace and unity. Event attendees are given three copies of a custom edition of The Way to Happiness, one to keep for themselves and two more to pass on to others. Grammy-award winning Bassist, Producer and Composer Stanley Clarke, known for his influential work on double bass and electric base as well as for numerous film and television scores, performed at a recent United in Peace rally. At that same rally, Congresswoman Janice Hahn, the U.S. Representative from California’s 44th congressional district and previously a Los Angeles City Councilwoman, presented the United in Peace Foundation with a Congressional proclamation of recognition. After every Peace Ride, there are measurable drops in the crime rate of the neighborhoods that were visited.